Welcome to the Penny Farthing Club, founded in 2013 by Neil Laughton who was intrigued by these Victorian era bicycles. The PFC has developed into a community of enthusiastic riders, racers and polo players! The Club has more than a dozen modern replica bikes of various sizes and offers rider training, events throughout the year and we’re available for private hire, corporate team building and film / photo commissions. Club Membership is open to anyone tall enough to reach the pedals! 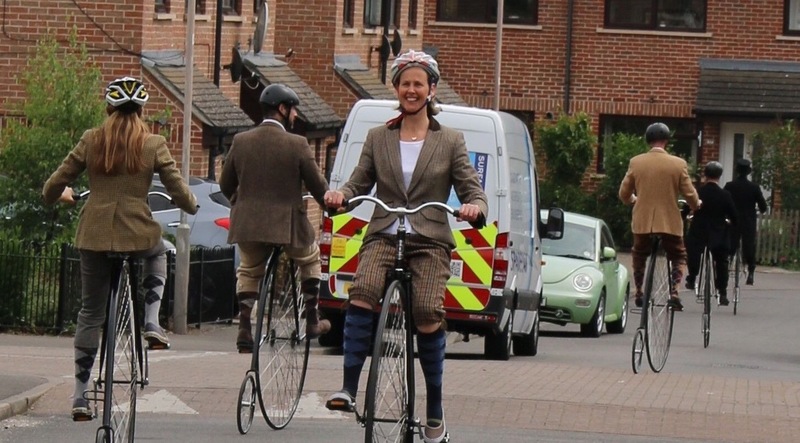 You are welcome to join the Penny Farthing Club, male or female, providing you are over 18, you are 5ft 4 inches (163 cm) or taller, weigh less than 100 kg (220 Lbs) and you are in good physical shape. Velocipede (/vəˈlɒsəpiːd/; Latin for “fast foot”) is a human-powered land vehicle with one or more wheels. 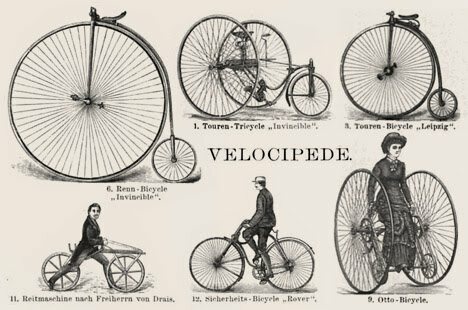 The most common type of velocipede today is the bicycle. 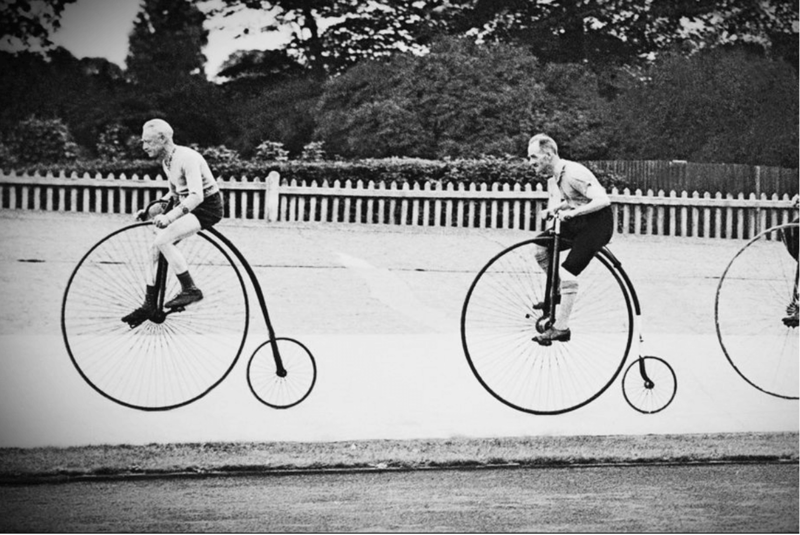 During the 1870s advances in metallurgy led to the development of the first all-metal velocipedes. The pedals were still attached directly to the front wheel, which became larger and larger as makers realised that the larger the wheel, the faster and farther you could travel with one rotation of the pedals. Solid rubber tires and the long spokes of the large front wheel provided a much smoother ride than its predecessor, the Boneshaker. This type of velocipede was the first to be called a bicycle (“two wheel”) and its shape led to the nickname Penny Farthing in the UK. They enjoyed great popularity in the 1880’s, at least by those that could afford them. 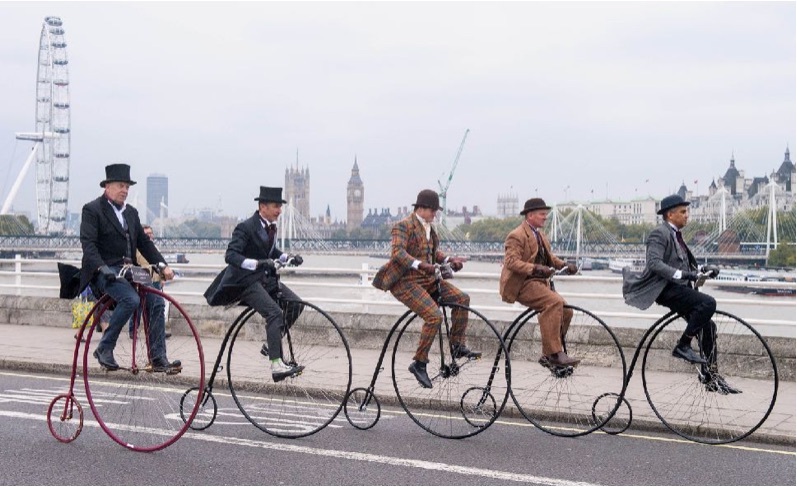 Although the trend was short-lived, the Penny Farthing became a symbol of the late Victorian era. 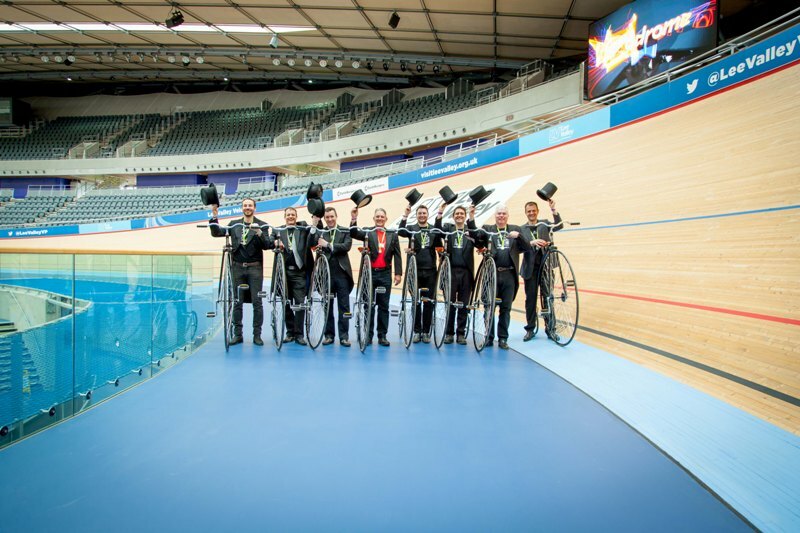 Its popularity also coincided with the birth of cycling as a sport. The Club Secretary runs rider training courses which are available to book through Airbnb Experiences or Fromigo. 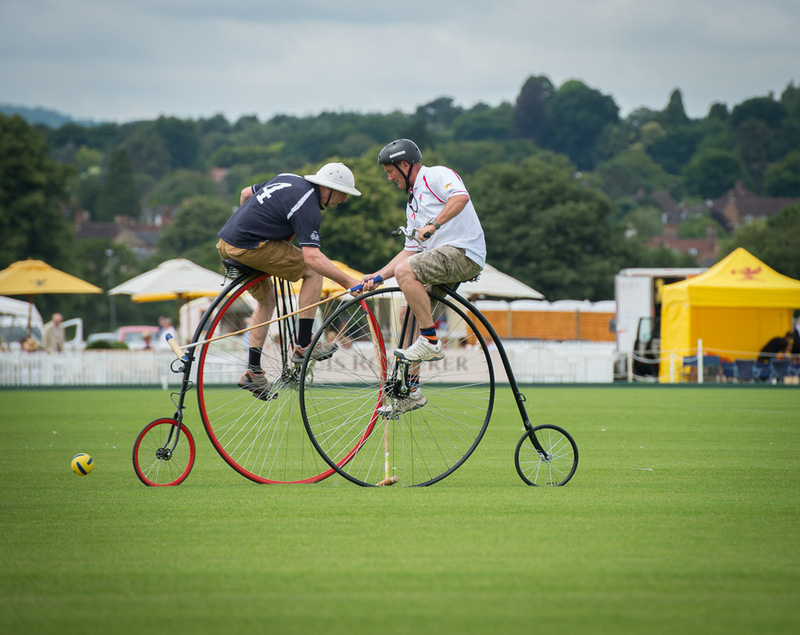 Completing a training course entitles you to a years complimentary membership of the Penny Farthing Club. Please see the Events section for a list of dates and book direct online. 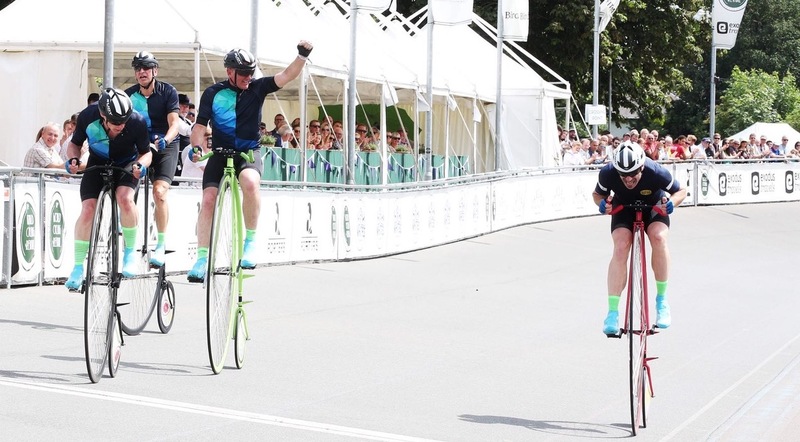 When you become a member of the Penny Farthing Club, you will be eligible and encouraged to participate in the Club’s exciting events and activities. 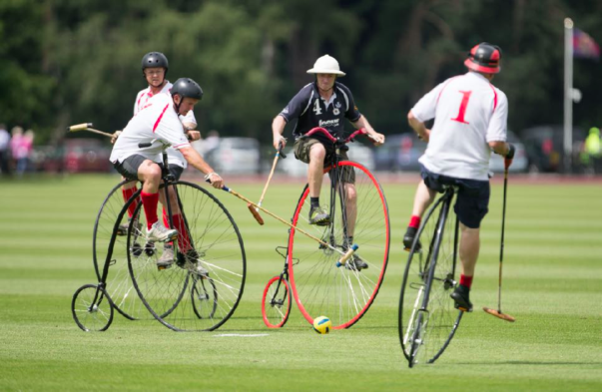 These include social rides, charity events, Victorian costume rides, paid corporate engagements, Penny Farthing Polo and road / track racing. Please see the Events section for a list of dates and confirm your attendance with the Club Secretary. 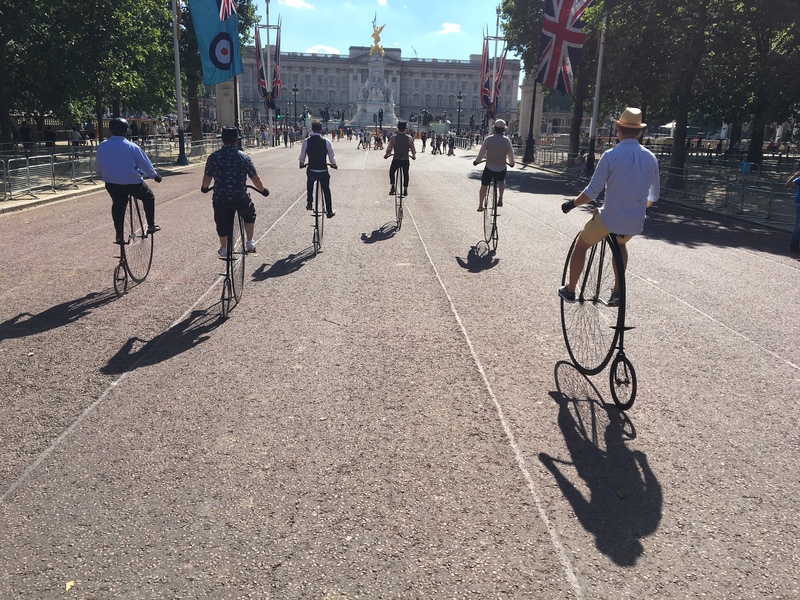 We welcome opportunities to work with commercial organisations and we can make up to a dozen penny farthing bikes available with experienced instructors for special events, team-building rides or PR opportunities. Please contact the Club Secretary for availability and costs.